Progress. Hardly any word describes better what is special about the last 200-250 years of human history. Up to then, technological, economic, social progress was scarce, the European Medieval was characterized rather by regress, for instance. But then, then came the Great Transformation, the Industrial Revolution, and changed everything. Today, it is clear to (almost) everyone that the pursuit of progress is what defines humanity, even though it is not the whole definition. Yes, we have difficulties when it comes to agreeing on what progress is. But we mostly identify progress, at least implicitly, with technological progress – all the nice innovations, not necessarily technical in a narrow sense, but also e.g. institutional, that make us less dependent on nature. This is, indeed, what defines social progress in the end – our ability to overcome scarcities and obstacles “created” by nature, be it with regard to natural resources for production, be it our psyche. When it comes to the former, however, it may be argued that we do not really become less dependent – we only change the source of dependence. Over most of human history, societies were inherently dependent on what the local environment “gave” to them in terms of food, materials, energy etc. While we always have been and likely will be dependent on nature’s “services” for our survival, many people all over the world are not any more dependent on what grows or can be found in their nearest proximity. Instead, humanity as a whole turned to a sort of portfolio strategy, diversifying the sources where our food, energy, materials and so on come from. A drought in Middle Europe, for example, while being a highly unpleasant event, does not instantly cause hunger and starvation in this region. If German power plants cannot import coal from, say, Columbia, they can buy some from Australia on the world market. Consumers won’t even notice. Also, due to globalization, we have access not only to multiple sources of a given good, but also to multiple substitutes of it. Think of all the food stuff you are enjoying your great-grandparents couldn’t even imagine. Not to mention the vast majority of the people living before the Industrial Revolution who had only a tiny proportion of the choices we enjoy today. All this we owe to globalization and the expansion of free markets. 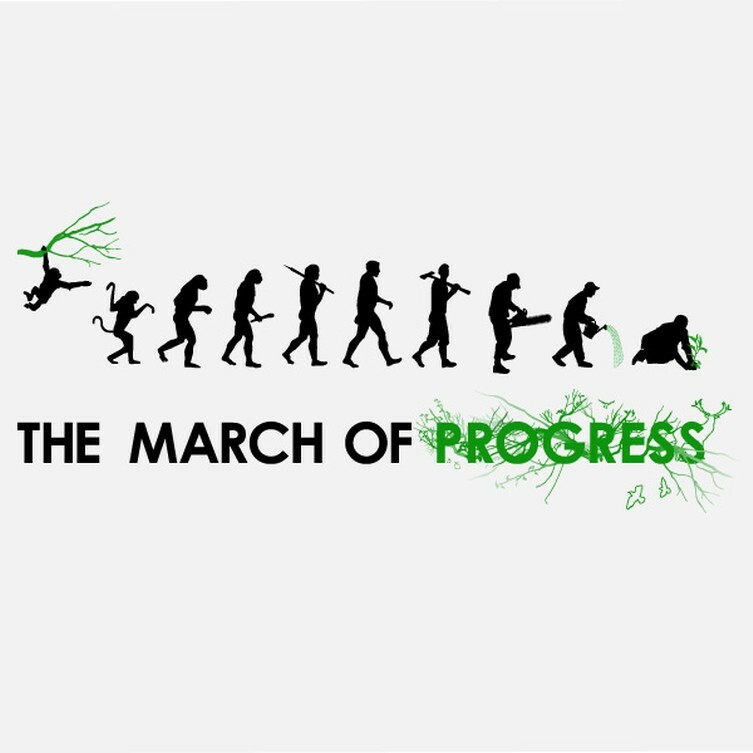 The other component of progress, the more tangible one, is technology in a more narrow sense – machines, chemicals etc. The vast majority of these little and big things that make our lives easier, be it airplanes, be it refrigerators, be it vacuum cleaners or nuclear power plants, could only be made available due to a social process that lies at the heart of capitalism – specialization. We have learned, thanks to Adam Smith, David Ricardo and Henry Ford, among others, that we can produce things much more efficiently if we divide the process of production in tiny parts and let conduct them by people who are specialists, experts in that. This is true both of production processes within a single factory and along a (often global) chain of production, where different tasks and sub-products are business of subcontractors dispersed all over the world. In addition to specialization, progress is about mechanization or, as economists call it, increasing the productivity of labour. In most advanced industries, production is only possible thanks to a large number of machines and computers deployed in the production processes. It is men who operate them, but it is not men who make the actual products. And this is great – machines can do things that people do not want to because a) they are dangerous (just think of robots used to disarm bombs), b) they are too dull and boring, c) we are not precise enough, d) we are not quick enough. Seen from this perspective, progress is a great thing. But it has come at a cost. The fact is that, acknowledging all the benefits we gain from globalization, specialization, free markets and mechanization, we have to face the reality that while they have enabled us to become less dependent on nature, we have become terribly dependent on them. Indeed, we have become so dependent on the fruits of technological progress that our only idea to cure its negative side-effects is more technological progress. The height of this is the idea of dealing with the warming global climate through geo-engineering. But the bulk of our dependence is more subtle. How many of us could survive if the internet or food markets or energy generation would break down for a longer period of time? I think, most of us would survive, but this would be an incredibly painful experience, since most people in the so-called developed world (and, increasingly, in the developing world, too) are not able to grow their own food, to repair and build things of practical use. We don’t need to, unless some calamity leads to a breakdown of all the “technological” and institutional systems that sustain our societies. If this would happen, however, our world would suddenly look like in the Hollywood film Cloud Atlas, where society has broken down and resembles hunters-and-gatherers societies more than ours. Of course, this is highly unlikely, and I don’t think The Wachowskis’ and Tom Tykwer’s vision will become reality any time soon, but it should be clear that we are buying increasing independence from natural systems at the cost of increasing dependence on human systems. Looked at from this perspective, progress appears as changing patterns of dependence instead of overcoming it. Is it bad that we pay the dependence-price for progress? Or is it maybe irrelevant since the breakdown of human systems is highly improbable and they have proven more reliable than natural systems? The answer to both questions, as they are put, is “No”. The fact that we are dependent on the systems we’ve created would be a bad thing if we would have an alternative. Going back to a pre-industrial level of dependence on nature is neither feasible nor desirable. It is true that, so far, human systems seem to be more reliable than natural systems only (of course, I do not want to say that we have become independent of nature – that would be wrong; our direct dependence on natural systems has become smaller, however). But I do not think that the status quo we are living in is the optimal state. We have become too dependent on human systems. Some critics of the idea of continued economic growth, most notably the German Niko Paech, have incorporated this diagnose in their proposals as to how we could overcome the problems created by the insatiable growth of human systems. Paech calls for sufficiency and subsistence, i.e., the acceptance that our needs have limits and the development of practical skills and abilities that would make us, yes, less dependent on markets, industries and global trade networks. While his goal is mainly to protect the biosphere (and ourselves) from our overgrown activities, some of his proposals, particularly the calls for sufficiency and subsistence, have obvious relevance for our discussion here.